Ippolito asks “What will be lost when emulation is the only solution for reliving out-of-date software?” (Ippolito, 135) When Earthbound was originally marketed and sold, it ran you about $70 ($115 dollars in today’s money) but you also received an important guidebook that not only taught you how to play the game, but included a lot of unique artwork and secrets that you could only find in that guidebook during the time. They even included scratch and sniff stickers that were part of the advertising campaign. The book included lore and other information about the towns you would be visiting and was overall, a helpful companion as you played through your quest. The book also gave the player tips and tricks on how to progress in the game. You have to remember the internet was in its infancy at this time and if you got stuck in a game, you could not just Google your way out. In an RPG like Earthbound, the path towards progress is not always a clear one. 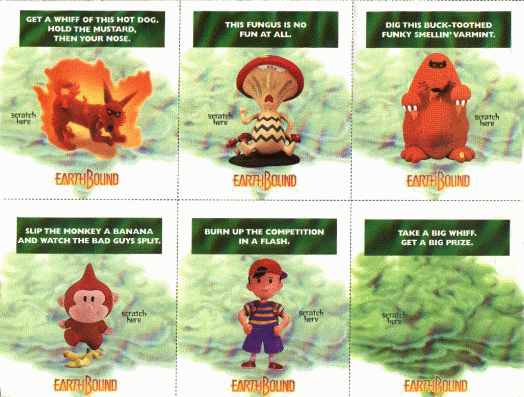 You can see that by emulating the game, you are missing out on the experience that the game developers intended you to have while playing Earthbound. Here in lies the problem with emulation, you are merely replicating the gameplay, not the gaming experience. Of course I could go and spend $200 for a system and game (cartridge only), but I would still be missing the guidebook and would be spending quite the penny on a twenty year old game I could play for free on my computer. Interestingly enough, the developers of Earthbound put some interesting measures in play to combat piracy of the game. Earthbound provides ground for and against emulation. It is one of the few games to do so as well. Emulation has a time and place in the industry, for preservation of older hardware and software that cannot be easily accessed. It is important to keep these relics of gaming history as a way of preserving the culture surrounding these games; almost like a time capsule. But emulation should be used knowing that it is not replicating the experience of playing the game, merely the gameplay itself. Additionally, emulation should be used responsibly and not in an effort to scam developers out of money. In his chapter, Emulation, Ippolito discusses how Nintendo believes that emulation is “the greatest threat to date to the intellectual property rights of video game developers” (Ippolito, 139). I believe my use of emulation is justified because I am a broke college student who does not have a few hundred dollars laying around to spend on “prehistoric” video games 🙂 I would argue however, that if you have the means to do so, to buy an official emulation of Earthbound on the WiiU’s Virtual Console eShop. Ippolito, Jon. “Emulation.” In Debugging Game History: A Critical Lexicon, edited by Raiford Guins and Henry Lowood, 133–41. MIT Press, 2016.